Aruba S.p.A. operates its zero-impact data center using ‘a river of energy’ hydroelectric plant, solar panels and chilling underground water. 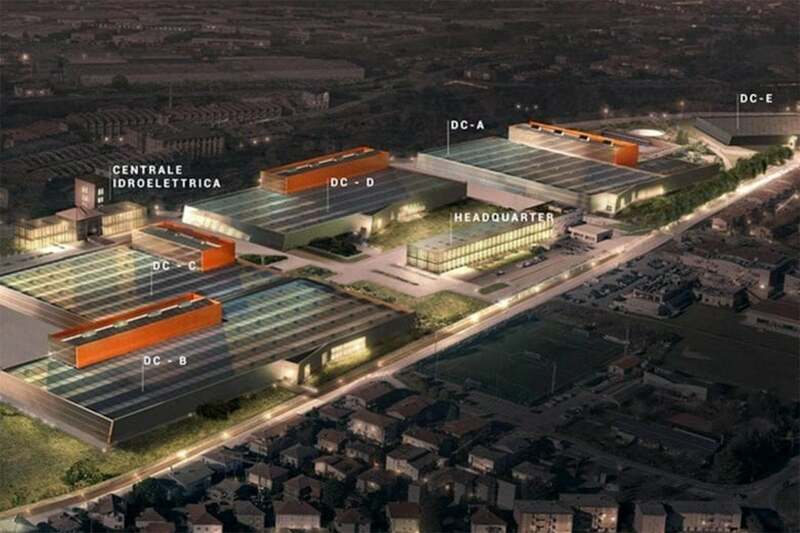 Aruba’s newest data center, named the Global Cloud Data Center (IT3) is located near Milan, Italy, and claims to be 100 percent green. The 49-acre ANSI/TIA-942 Rating 4 standard facility (at 200,000 square meters) opened earlier this month. Low-impact credentials at the site come largely because the data center has its own dedicated hydroelectric plant. The facility is located on the banks of the River Brembo, an Aruba representative told me. Electricity is generated from the running river water through the operation of turbines. That power is stored and then injected into the national grid infrastructure. Electricity is supposedly guaranteed for the campus by the national grid in exchange for the input. The system, along with the power from solar panels, can produce up to 90 MWs of power. The “river of energy” flows “more or less” constantly, Aruba says. The company says cooling at the facility is also zero-impact. “Using groundwater as the main cooling energy source enables us to reduce energy waste,” the company explains of its geothermal system on its website. That’s in part because underground water at the site always remains at 48 degrees Fahrenheit throughout the year. That cold water is pumped up from the ground, used to cool the data halls via heat exchangers, and then returned back into the earth. By doing that, environmental impacts do not happen, the firm says. Other eco-friendly techniques are in operation, too: Distinct ducts in the server rack design aid efficiency by targeting underground-cooled air onto the parts of the rack that need cooling the most. Also, double insulation with a defrost system is used in the data room construction. Energy is further saved by using outside air to cool rooms, the firm explains. Hot air is blown out of the building using fans, and electric shutters open and close as is needed. Chillers are available, but only as backup. Is the data center safe from floods? One question I had when looking at the design: If the data center is on the banks of a river with enough water flow to generate power, is there a chance it could flood during rain events? That’s not an issue, says Aruba. The buildings are raised above the regular ground, and the channel has capacity for an extra 23 meters of water depth, according to a hydrological plan published on the website. Additionally, the representative said the data center complies with next year’s European General Data Protection Regulation (GDPR), which introduces more stringent European consumer data protection for global companies doing business in the trading bloc.